The way we currently produce our food is damaging both to ourselves and our planet. We need to create gardens, woodlands and farms which are in harmony with nature. Natural ecosystems are good models, but many of the plants they contain are not edible. So we need to discover a wide variety of easily grown perennials and self-seeding annuals which provide delicious and healthy food. Describing edible and other useful plants, both native to Britain and Europe and from temperate areas around the world, this book includes those suitable for: the ornamental garden, the lawn, shady areas, ponds, walls, hedges, agroforestry and conservation. 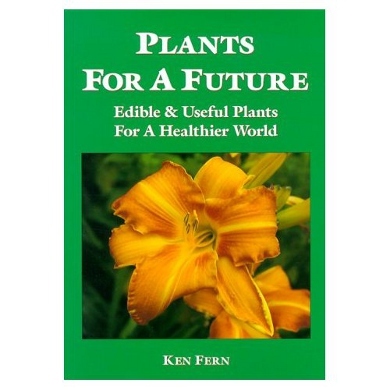 In this thoroughly useful book, Ken Fern shares his experiments and successes in growing herbs, vegetables, flowers, shrubs and trees. Packed with information, personal anecdote and detailed appendices and indexes, this pioneering book takes gardening, conservation and ecology into a new dimension. In 1974, whilst employed as a bus driver in London, Ken Fern obtained a small plot of land in Surrey with the idea of becoming self-sufficient in food and of providing a cash income with the surplus. After a couple of years of growing an acre of vegetables by hand he decided that there must be easier and more environmentally friendly ways of growing food. It was at this time that he read the book Forest Farming by Robert Hart and James Sholto-Douglas, and this convinced him that the future of food production lay in perennial plants. This is how Ken started his experiments with alternative food crops. With this experience coupled with his travels around the gardens of Britain, he has acquired a vast wealth of knowledge about how well these plants can grow. As a result, he has now developed a database of 7,000 species of edible and useful plants. In 1989, he moved to Cornwall and helped set up a demonstration site at Penpol. Over 1,500 different species of plant are being grown here and an educational charity, called Plants For A Future, has been established to promote and spread the work of the project. Ken is considered to be a leading expert in his field, and has written many articles on the subject. He gives lectures, runs courses and gives practical demonstrations on useful plants.